Fans crossing their fingers for Boba Fett pig have reason to hope. Maybe. Mash-ups are relatively new to the smartphone and tablet scene, with Disney leading the charge with its hit mobile game, Where's My Water?, which recently merged with Tim Burton's animated film, Frankenweenie. Publisher Rovio Entertainment may trump that with perhaps the biggest video game collaboration of all, the company's popular franchise, Angry Birds, and a property that needs no introduction, Star Wars. The fruit of this lucrative partnership with Lucasfilm, a new game called Angry Birds Star Wars, debuts November 8 across iOS and Android, among other platforms. Before that, however, fans will be able to purchase a variety of Angry Birds Star Wars products from Toys R Us and other participating retailers beginning October 28. With this in mind, and facing an intellectual property collision of massive proportions, we caught up with Rovio's Vice President of Franchise Development, Ville Heijari, to talk, well, what else? Angry Birds Star Wars. How did this partnership form between Rovio Entertainment and Lucasfilm? After Angry Birds Space, we kept thinking, where do we go from here? In the aftermath of launching Space, all the sci-fi properties were under discussion, but what's bigger than Star Wars in that domain? It was something we really wanted to do, and the designers are big fans. We had a mutual discussion with Lucasfilm on how to make the two big franchises work together. Ultimately, we came to the conclusion there's so much more potential with story elements and characters. Then we created physical products out of it. So Lucasfilm was initially receptive to the idea? Everything was designed together, so it was their artists working with our artists. Some amazing sketches and art were explored. Then we worked together with their branding team. This is what I personally admire most about this project, that all of these things mash up together and were designed really nice. Everything feels organic. Will the video game appear on both iOS and Android November 8? Yes, iOS, Android, PC and Mac. We're also working on a Windows phone version and Windows 8 support. Can you tell us anything about the game? From our perspective, it's like what Angry Birds Space was, an evolution from the original Angry Birds. This is therefore the next evolution from Angry Birds Space. I don't want to spoil too much, but there's a difference of development and elements that offer replay-ability. There will also be episodes based on the films and so forth. OK, so no confirmation of Force powers? [Laughs] These are not the Force powers you're looking for. Were you able to put the Star Wars music into the game? There's a lot of the branding. When working with something like Star Wars, there are so many elements to it, the music and characters. It was complicated putting everything together, but we managed to get there and make really cool stuff. Typically, Rovio doesn't go through gaming press to announce new releases. 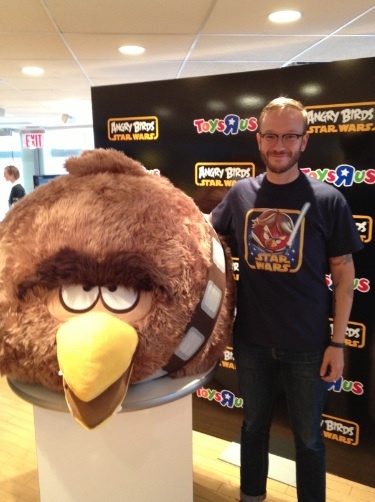 Case in point, we found out about Angry Birds Star Wars through USA Today. Is this intentional? We want to be mainstream, and reach out to the mainstream audience. We don't necessarily go through the traditional way. We want to be different. We use social media a lot, but not always the same thing. We launched an Angry Birds Tumblr with a Star Wars theme. What did we put there? An animated gif with the lightsaber bird. For a couple seconds, we thought, we're launching a new franchise with an animated gif. Is it 1994 again or something? Of course, people share the Tumblr and everything feels right. What about the merchandising? Is this it, or can we expect more products in 2013? This is the first wave, so we'll see where we go from here, with more episodes, more characters and content. No Boba Fett Angry Bird? Well, he's one of the bad guys, without spoiling anything. Fair enough. We look forward to seeing the game.